Looking to live on Finchley Road? A major thoroughfare through north London, the road is now home to many looking for the London lifestyle without the disadvantages of living in the city centre. Everyone likes seeing the animals! Less than 10 minutes by car or the tube, the zoo is famous world round for its animals big and small from all over the globe. See seahorses and penguins, monkeys and gorillas, butterflies and tigers all in the same day. Take the family or just go with friends and enjoy some time outside. With over 7 million visitors every year, it’s easy to see why Hampstead Heath is so popular. The park offers a multitude of things to do, from sports and swimming to picnics and leisurely walks. And at just 10 minutes by car or under 15 by the tube, enjoying everything the park has to offer is easy. One of the most well-known attractions London has to offer, Madame Tussauds provides a great day of fun and laughs. 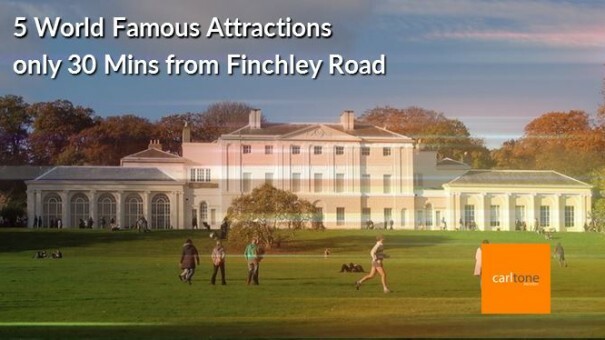 Only a short drive from Finchley Road, the attraction lets you get up close and personal to celebrities and authoritative figures, then get on some rides and attractions before buying souvenirs to take back home. Sherlock Holmes has been loved for hundreds of years and recent incarnations in film and television have made him a celebrity once more. The museum, aptly located at 221b Baker Street, can be found on the edge of Regent Park. Although a little further from Finchley Road than some of the previous attractions, it is well worth the hike! An original Edwardian bookshop, Daunt Books is famous for its long oak galleries filled with books and graceful skylights, perfect for some light reading. A leading travel and literary bookshop, it has provided some of the best to London for over 25 years. The original Daunt Books can be found in Marylebone High Street, close to the Sherlock Holmes Museum. Alternatively, another Daunt Books can also be found closer to Finchley Road in Belsize Park. Ready to move? Talk to Carltone and get the London lifestyle today!